Mmmmm peanut butter. I have a bit of a peanut butter addiction. If I can’t figure out something else to eat I revert to peanut butter and jelly, or peanut butter and honey, or peanut butter and banana. I put peanut butter on pancakes, and waffles, banana bread, and oatmeal. So naturally, I’m a big fan of peanut butter cookies. 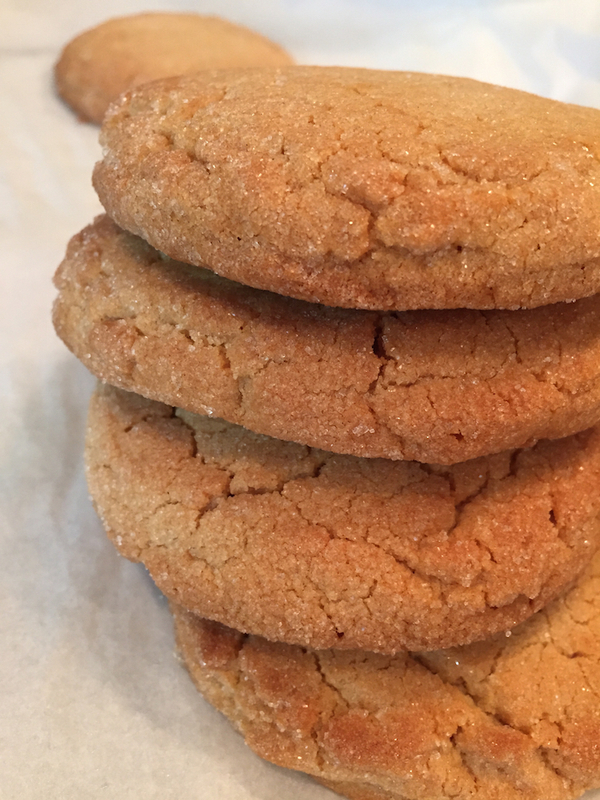 And these peanut butter cookies are fantastic. They’re tender and chewy and have a nice crunchy exterior. They’re a fantastic cookie, and as the weather is warming up, I think they’d be the perfect choice for ice cream sandwiches. In a large bowl (or stand mixer), beat the eggs, peanut butter, butter, sugars, and vanilla, until smooth and creamy, about 4 minutes. Scrape down the sides as needed. Add the flour, baking soda, and salt and beat on low speed until just incorporated. Add the 1/2 cup of granulated sugar to a shallow dish. Using a large cookie scoop (I used 4 oz), scoop the dough and roll in the sugar. Line a baking sheet with parchment paper, and then line the sugar-coated dough balls close together to chill. Once you’ve filled the baking sheet, freeze or refrigerate the dough balls for about an hour, or until firm. When ready to bake, preheat the oven to 350°F. Line a baking sheet with parchment paper, silpat, or spray with cooking spray. Place dough balls about 2 inches apart on the pan. Bake for 12-15 minutes, or until the center is set and the edges begin to brown. Let cool on the pan for a few minutes, then remove to a wire rack to cool completely.